Welcome to Techno-Billies: Arggh Jim-Lad!!! 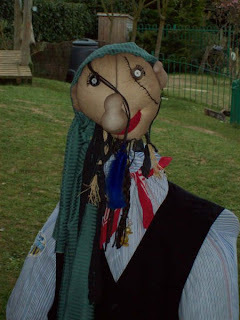 Do you remember my first scarecrow? Well here is no. 2! He's a salty sailor and no mistake... (Good grief why did I say that?) modelled on Johnny Dep in Pirates of the Carribean... can't you see the resemblance? I know it looks like he has two scars but one is actually his hair which is blowing in front of his face. 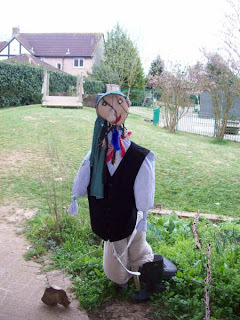 And clothed by a nursery school teacher who has found him a home in the school garden. Apparently the children are really pleased... which makes me really pleased too! The next project is a French onion seller for friends who live in the south of France (hopefully finished before I go to Africa).... mmmm... a little Gauloise in the corner of 'la bouche' methinks. While I'm on the subject... here's a quick update on the garden. Everything is growing! Its so exciting! Photographs soon. Oh and the latest score with the hens... Wilma 1 - Miss Skinny 0. Miss Skinny is limping and has several feathers missing showing bare flesh (I suspect Wilma jumped on her but I didnt see it so I cant say for sure). We have segregated them to give Miss Skinny a chance to recover. We cant see any obvious injury on the leg but she is definitely a bit glum. She now has a cosy little arc all to herself with plenty of fresh straw, clean water and I added some poultry spice to her feed. She can see Wilma through the chicken wire so hopefully neither of them will feel lonely. Get Well soon Miss Skinny. Scarecrows are amongst my favourite things. We have one in our school garden also. The students of the school made a special one as part of the many gifts to the school principal on her retirement, as she was a very keen gardener. I like what you've done.